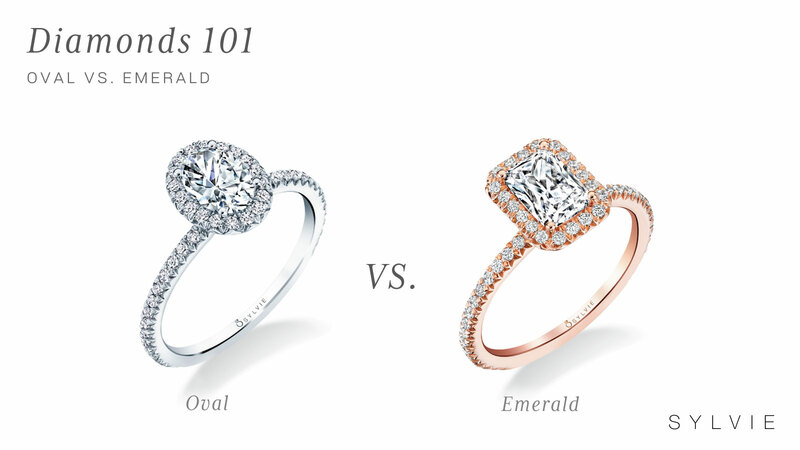 OVAL VS. EMERALD, WHICH SHOULD YOU CHOOSE? When picking engagement rings, consider the cut of the center diamond. True, every cut is unique and reflects the wearer’s personality, but oval cut and emerald cut diamonds look particularly beautiful on almost all hand shapes and sizes. As we take a closer look at oval and emerald-cut diamonds, we hope it will help you choose the perfect cut for your future bride! Similar to a round diamond, an oval cut diamond is round but slightly elongated. It is a beautiful fusion of two diamonds with a flanked center and most commonly sought in three-stone rings. When cut to perfection, the stone’s brilliance shines right through. 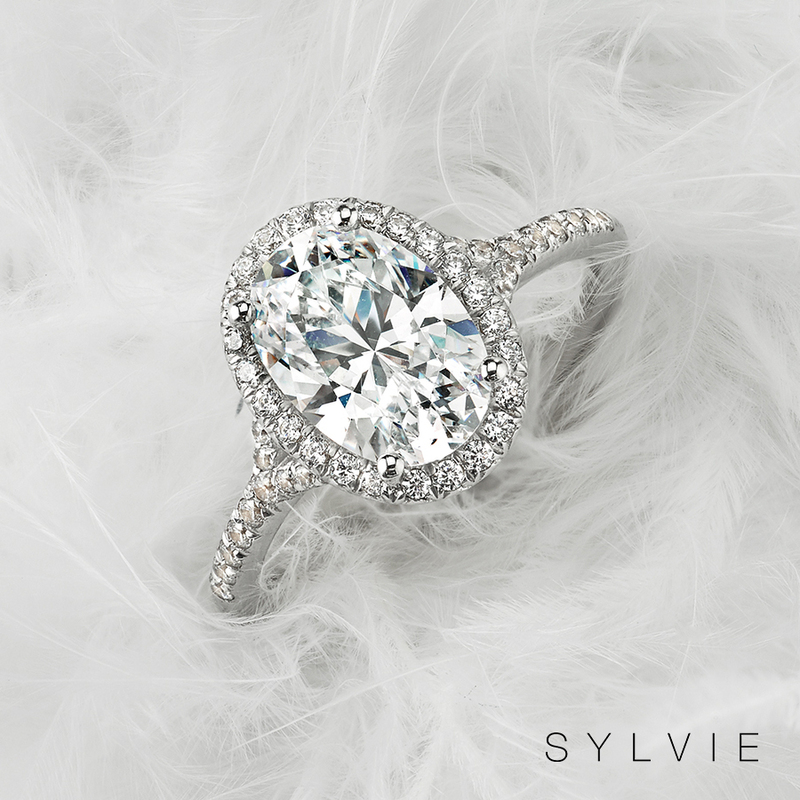 The oval cut diamond’s popularization in movies like the Twilight saga sparked more requests for it at Sylvie Collection retail stores. Its ideal curvature makes it timeless and enhances the ring’s overall appeal. Oval cut diamond rings are ideal for short or small hands, giving the illusion of slender fingers. 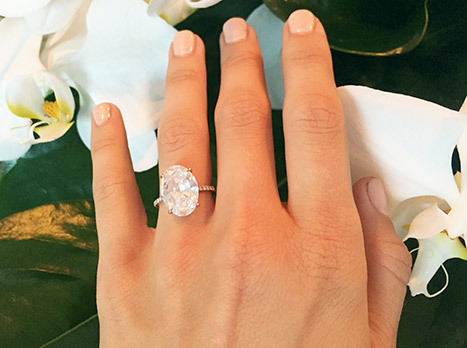 Blake Lively is one of many celebrities who wears an oval engagement ring. 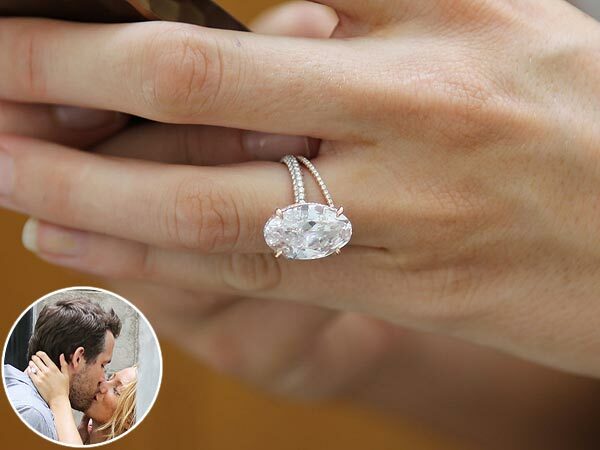 Gifted to her by husband Ryan Reynolds in 2012, the stunning rose-gold oval cut engagement ring beautifully complimented the Gossip Girl star. Another celeb with an oval engagement ring is professional singer and dancer Julianne Hough. 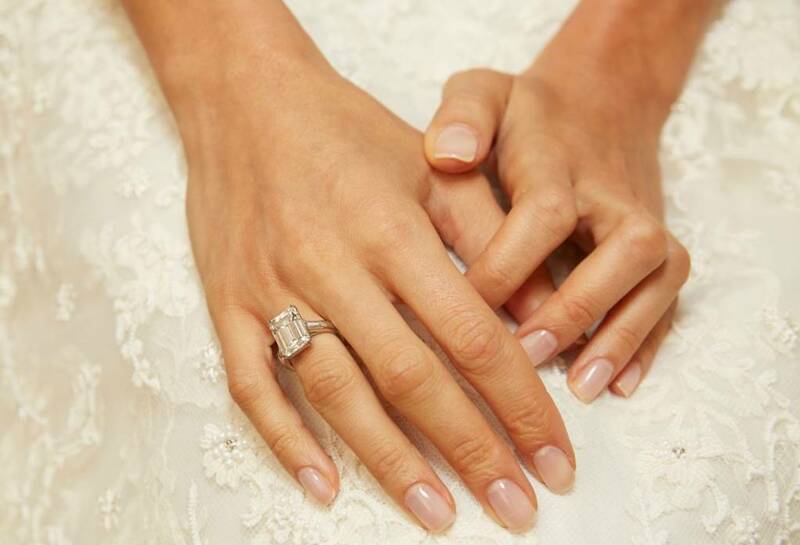 Her ring is a whopping six carats and was given to her by star hockey player Brooks Laich. Also known as a step cut diamond, an emerald cut diamond comes with fewer facets (25 to be exact) than a round cut diamond. Emerald cut is usually in a square or rectangular shape and has tapered corners. Since an emerald cut has fewer facets, the diamond has limited surface to reflect light off of it. However, this does not make emerald cut engagement rings less desirable. It is most popular among those looking for something unique and enchanting. Moreover, they are one of the most popular heirlooms in diamond engagement ring history. If your significant other is all about glamour and elegance, an emerald cut ring is the style for her! Thanks to its flat surface, lean facets, and extended sides, the stone has more potential to flaunt its clarity. Although it may be limited in terms of brilliance, it surely makes up for it in elegance! Here a few celebrities who wear their emerald engagement rings beautifully and confidently. Amal Clooney exhibits a 7-carat emerald ring with baguettes set on a platinum band. Additionally, the “Queen B” herself, Beyoncé, flaunts an 18-carat emerald diamond ring given to her from beloved husband Jay Z. 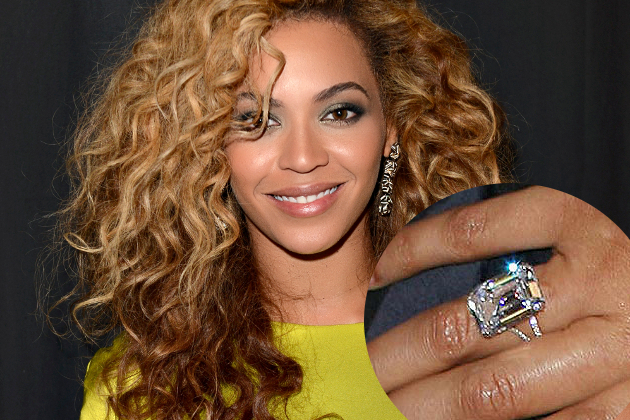 Clearly, he liked it so he put a ring on it– an 18-carat emerald cut diamond to be exact! 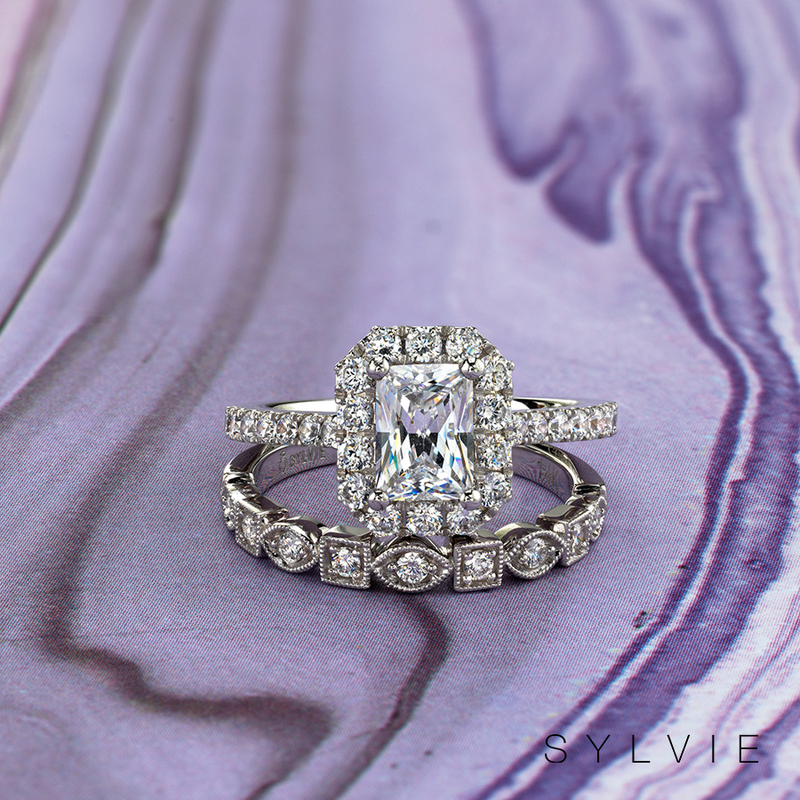 If after reading this blog, you just can’t resist, head to sylviecollection.com to see more beautiful Oval and Emerald styles! At Sylvie, the customization opportunities are endless so check out all the settings to see what fits you best. We can’t wait to see what you choose!